The title refers to Brazil, of course. 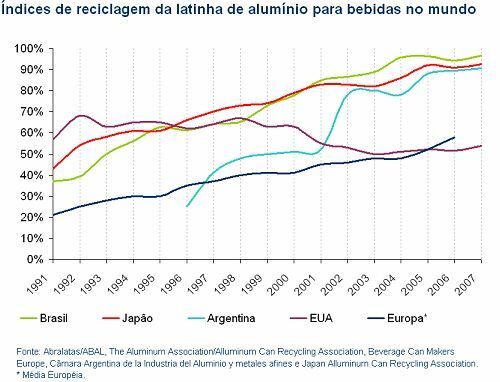 The Brazilian Association of Manufacturers of Highly Recyclable Cans (Abralatas) — what the Brazilian Association of Aluminum Can Manufacturers now calls itself — and the Brazilian Aluminum Association (ABAL) have just released their final, official recycling statistics for 2007. For the seventh year in a row, Brazil leads all other nations, including Japan and the US. In 2007 Brazil recycled 96.5% of the aluminum cans sold on its market, corresponding to 11.9 billion cans for the year, or about 32.6 million per day or 1.4 million per hour. 160.6 million metric tons were collected and transformed into new cans, up 15.5% over 2006 (but then, 2006 saw an almost 2% slump over 2005). What accounts for Brazil’s success? Well, I discussed that question at length in a prior post. In a nutshell, it’s a combination of high price for aluminum scrap, some proactive moves by industry, cooperation from municipal sanitation services, extensive environmental education efforts by local governments and NGOs, and favoring of aluminum cans by Brazil’s waste pickers, the catadores. Check out the chart at right (click to enlarge), and note who’s in third place: Argentina. Argentina has surpassed the US and most of Europe for several years now, and its recycling growth is keeping pace with second place Japan. 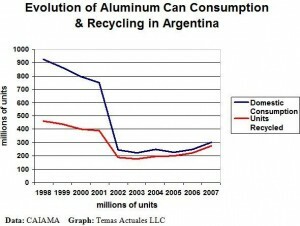 But as I pointed out in “Aluminum Recycling Reconsidered“, Argentina’s recycling rate may be a bit misleading. 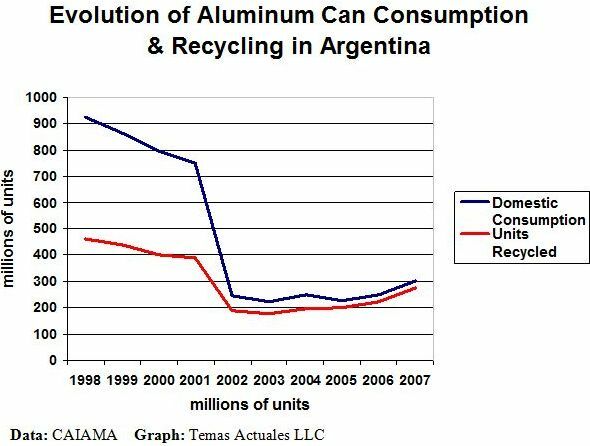 It has as much to do with the fact that domestic aluminum can consumption dropped precipitously during Argentina’s 2002 economic crisis (down to 1/3 of its prior size), whereas can collection was only halved. Consumption has never really recovered, whereas collection has risen slowly but surely (see second chart below — click to enlarge). Com índice de 96,5% o Brasil mantém a liderança mundial e bate recorde registrado em 2005. 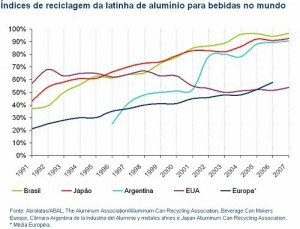 Pelo sétimo ano consecutivo, o Brasil lidera o ranking mundial da reciclagem de latas de alumínio para bebidas. O País reciclou 96,5% do total de latas de alumínio para bebidas comercializadas no mercado interno, o que corresponde a 11,9 bilhões de unidades, 32,6 milhões por dia ou 1,4 milhão por hora. Foram 160,6 mil toneladas de latinhas coletadas e transformadas novamente em lata de alumínio, registrando um aumento de 15,5% em relação a 2006. Em 2007, o setor movimentou R$ 1,8 bilhão na economia, sendo R$ 523 milhões injetados diretamente na coleta de latas de alumínio, o que significa 1,3 milhões de salários mínimos, gerando emprego e renda para 180 mil pessoas. A reciclagem das latinhas de alumínio para bebidas reduzem em 95% as emissões de gases do efeito estufa e, no ano passado, proporcionou uma economia de 2.329 GWh de energia elétrica ao País, o suficiente para abastecer, por um ano inteiro, uma cidade com mais de um milhão de habitantes, como Campinas-SP, uma economia maior que a proporcionada pelo horário de Verão.